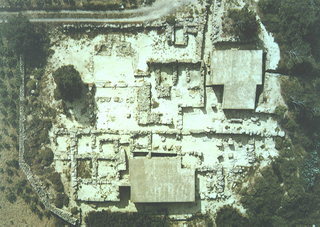 The Minoan villa at Vathypetro was most likely the residence of a local ruler. Its architecture is comparable to that of a "Little Palace": it has a central and west court, a small tripartite shrine, a three-columned portico, storerooms and workshops. It seems that the construction of the building was never completed. Interesting elements of its architecture are the installations of a wine-press in the south wing and an oil-press in the courtyard. The construction of the villa started in ca. 1580 B.C. and lasted for thirty years but only the west wing was completed. The interior wall of the east wing had just started to be built when the whole structure was destroyed, possibly by an earthquake, and abandoned in 1550 B.C.